Although the St. John’s Medical College was founded in 1963, it was conceived twenty years earlier when Dr. Sr. Mary Glowery of the Sacred Heart Congregation proposed that the Catholic Hospitals Associations of India consider the establishment of a Catholic medical college to serve the various social welfare institutions belonging to the Catholic Church in India. This proposal was taken up by the Catholic Bishops’ Conference of India. At the request of the Catholic Bishops' Conference of India (CBCI), the late Archbishop of Madras, the Most Rev. Louis Mathias, SDB, prepared and presented a report in 1954, in which he reviewed the total requirement of the project. In 1956, Archbishop Mathias, with the aid of medical and financial experts, submitted a comprehensive scheme to the Conference, and in September 1960, the CBCI took the decision to establish a Medical College, with an attached hospital at Bangalore. Pope John XXIII agreed to the College being called after his Patron, St. John the Baptist, as a mark of his personal interest in the project, and of his approval of its aims and ideals. The college was, accordingly, named "St. John's Medical College" and opened at temporary premises in Bangalore in July 1963. The Corner Stone was blessed by Pope Paul VI, in Bombay during the Eucharist Congress in 1964. It was laid at the project site on July 27, 1965, by Shri V.V. Giri, the Governor of Karnataka, and later President of India. On the completion of the buildings, the College was dedicated to the cause of Medical Education, Research and Care, on September 29, 1968, at a ceremony presided over by the late President of India, Dr. Zakir Hussain. In June 1968 the college moved to its permanent campus on a 140 acres site in Bangalore. The National Assessment and Accreditation Council, a Review Committee of the University Grants Commission, has recognized the excellence of St. John's Medical College and Hospital and accorded it with a 5 star grading. St. John's College of Nursing started as a School of Nursing on July 1, 1980. It was raised to the status of a College of Nursing on September 25, 1989, and conducts various nursing courses. Through this institution, the Catholic Church seeks to make a significant contribution to medical education and service, the improvement of which is a primary need of the Country. In this endeavour, its constant aim is not only to train medical, paramedical and nursing students at the undergraduate and postgraduate levels and orient them to the current needs of the Country, but to undertake the training of teachers, specialists, research workers, health administrators, pastoral care personnel and community health workers for the overall advancement of the science of medicine and its effective application. As a primary means for the achievement of the institution's objectives, emphasis is placed, in the selection of students, on their character and commitment to values necessary for a broad-based and sound intellectual, spiritual, moral, physical and social education. 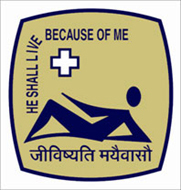 To serve the healthcare needs of the medically unreached populations with quality medical, paramedical, nursing and allied healthcare education, excellent and compassionate hospital services with state of the art facilities and to carry out health research for the betterment of the humankind in tune with the Christian values of the institution. To select and train doctors, nurses and other health professionals at the graduate and postgraduate levels and motivate them to work in rural areas of India in accordance with Christian values and Catholic moral and ethical teaching. To cater to the needs of the public and with special preference for the downtrodden and underprivileged by providing excellent inpatient and outpatient medical facilities at reasonable costs according to Christian values, irrespective of caste, creed and colour. With the central commitment to provide comprehensive nursing education and clinical skills, St. John's College of Nursing aims at turning out intellectually enlightened, morally upright, spiritually inspired, emotionally balanced and socially committed nurses. To make a significant impact on Lifestyle Related Disorders and Infectious Diseases in India through basic and clinical research, promotion of evidence based health care and population health research initiatives. To provide quality training in Health Care Management to personnel dedicated to the cause of serving the medically unreached and the poorest of the poor and to produce quality paramedical staff.